It makes absolutely no sense to purchase an expensive drysuit if you don't know how to keep your drysuit safe. Take care of your drysuit and your drysuit will take care of you. The following are some helpful hints and tips to help you maintain your drysuit. Rinse the drysuit after every use with a hose or in the bathtub especially if the drysuit has been in contact with salt water. Wash the drysuit every once in a while with special soap made specifically for Gore Tex or the drysuit. Never wash the drysuit with any other soaps or chemicals that were not specifically made for a drysuit. 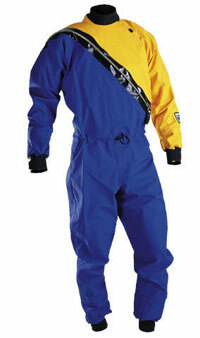 Make sure the drysuit is completely dry inside and out before storing the drysuit in a closet, etc. Do not dry the drysuit in a clothes dryer. Use the thickest hanger plastic (not metal) possible. The thick hanger with a wide shoulder made for suits and coats are great for a drysuit. Make sure the hanger length is long enough for the drysuit arms. Do not dry the drysuit in the sun and do not leave the drysuit in hot or humid conditions. Do not leave the drysuit in a place where the sun shines directly in the sun. UV breaks down the latex gaskets. If the drysuit is stored in the basement, fumes from the furnace will break down the latex gaskets, too. If the drysuit is stored in the garage, fumes from gasoline in the garage will break down the latex gaskets, too. Sun tan lotion and sun block lotion will break down the latex gaskets. Wash the gaskets when lotion has been in contact with the gaskets. Always leave all zippers completely open when the drysuit is stored because the zippers will become less effective if the zippers are left closed. Place a very light dab of Vaseline at the end of each zipper with a q-tip. This will help lubricate the zipper. To increase the useful life of your drysuit zippers, clean the zippers with a zipper cleaner and a toothbrush. Never store a drysuit in a hot car trunk as the heat and fumes will break down the drysuit and the latex gaskets. After the drysuit has been washed and the drysuit is day, apply a UV Protectant lightly to all the gaskets. I use 303 protectant. If you are not using the drysuit for a couple of months, apply a UV protectant to help maintain the gaskets. Gaskets will seem too tight in a new drysuit and will eventually stretch. You might want to stretch the neck by placing a wide plastic deli container in the neck and leave it overnight. Do not try to trim the gasket unless you are qualified as it might cause the gasket to fail. Maintaining and taking care of the drysuit correctly is very important as it will keep the drysuit safe as well as increase the life of the drysuit. Have fun paddling and don't forget to take care of your dry suit when you return from your paddle.